Art Deco Ivory and Gold Compact. A compact is an accessoire that allows women to carry face powder and a mirror in their handbag or pocket. Contemporary compacts conceal all manner of cosmetics, but originally they were designed to hold powder. They came in all shapes: round, octagonal, square, rectangular and figural to name a few. 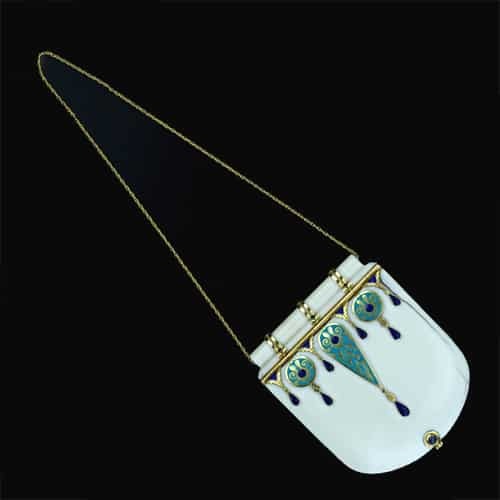 Sometimes they were built into a hand bag or were part of a minaudière along with lipstick and other “essential” items. They could be concealed in bracelets, hatpins, rings and pendants and were made of a variety of materials from gold to plastic. Enamel, lacquer, gemstones, engraving and many more decorative techniques were applied to creating the myriad of compacts that have been available since the Victorian era.